As Fleetwood Mac prepares for its new tour with original member Christine McVie, CBS Sunday Morning sent John Blackstone to Maui to speak with Mick Fleetwood, as well as Christine McVie and Stevie Nicks. Although the other two original members, Lindsey Buckingham and John McVie, will also be a part of the tour, they didn’t speak to CBS Sunday Morning. Christine McVie left the band in 1998, swearing she would never come back. Stevie Nicks said that when Christine called to tell her she wanted to rejoin the band, she couldn’t believe it. Christine told John Blackstone she was excited to be back with the band and said she’s really enjoying it. Having the band complete again has come at the right time, because they’re all getting older. Mick Fleetwood said he’s 67 years old and he’s not planning on leaving this world any time soon, but his age does make him want to get his house in order. “You do see the picture in a different way, just because you’re older,” he said. As a part of getting his life in order, Mick Fleetwood has just finished his autobiography Play On, which is out in October 2014. He writes about his divorces from three wives and his failures as a father to his three daughters. Mick Fleetwood said he thought people would think he “sold his soul” to his band after reading the book. But Christine McVie said she thought he did what he did out of love. Mick Fleetwood fell in love with the drums as a boy. He was self-trained as a drummer and moved to London at 15, determined to make a living as a drummer. John Blackstone asked him to describe his drumming style. “My drumming style…I’m not being overly humble, it’s just the easiest way: I don’t really know what I’m doing. I mean, I do. But if I start thinking about it…I don’t do it horribly consciously. And I’m not super slick,” he said. Mick Fleetwood said his famous sense of style came when he was a struggling musician and his friend Rod Stewart told him to spend whatever he had on one good suit. Mick said since then, he’s loved clothes and shoes. By the time he was 20, the English blues band he was in took the name Fleetwood Mac, combining his name with that of bass player John McVie. Over the next few years, a number of band players came and went. In 1975, the lineup was the classic one of Mick Fleetwood, along with two couples: John McVie and his wife Christine and Lindsey Buckingham and his girlfriend Stevie Nicks. Their first album together, a self-titled, included Stevie Nicks’s “Rhiannon” and Christine McVie’s “Say You Will Love Me”. The album sold 5 million copies and suddenly they were rock stars. Mick Fleetwood was the band’s manager, as well as drummer. He said he wanted to see everyone happy, including himself. So he didn’t pinch pennies. “All our assistants had limos. So we’d ride to an airport and there’d be like 20 limos for the lighting director and, you know,” he said. 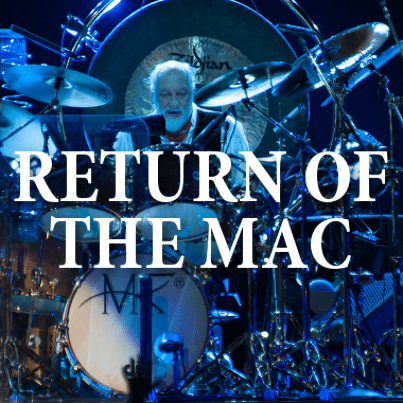 By the time they were writing their second album Rumours, Lindsey Buckingham and Stevie Nicks were breaking up, the McVies were divorcing, and Mick Fleetwood’s marriage was ending as well. The record company was calling them, wondering how they were pulling off staying together. Instead of breaking up as a band, they channeled it into their music. “Go You Own Way” was a message from Lindsey Buckingham to Stevie Nicks. Stevie Nicks’s message was “Dreams”. Meanwhile, Christine McVie’s “You Make Loving Fun” was written about her lover, not her husband. Mick Fleetwood said that John McVie calls their band a “living soap opera” because they’ve all dated and shared houses together. Mick and Stevie got together while touring for Rumours, but they split up because they felt like the band was more important than their relationship and they put their friendship back together. Mick Fleetwood and Stevie Nicks also shared a love of cocaine that grew to legendary proportions. Mick said he thought they spoke about it way too much, because people still ask him about it. Ultimately, though, Rumors sold 50 million copies. Mick Fleetwood said his love of spending money eventually piled up. His band mates fired him as manager after a decade. Later, Fleetwood declared bankruptcy. Buckingham quit the group for a decade in 1987. Stevie Nicks would leave for long stretches to pursue a solo career. Christine McVie retired. But Mick Fleetwood played on wherever he could, eventually forming a few island bands in Hawaii, which occasionally covers Fleetwood Mac songs. They play on the rooftop of the restaurant he opened two years ago. Now, Fleetwood Mac prepares for its brand new tour with its original line-up, which starts the first week of October.